Joaquin 'El Chapo' Guzman's wife Emma Coronel Aispuro was pictured arriving at federal court in Brooklyn, New York where the Mexican drug lord is currently on trial. 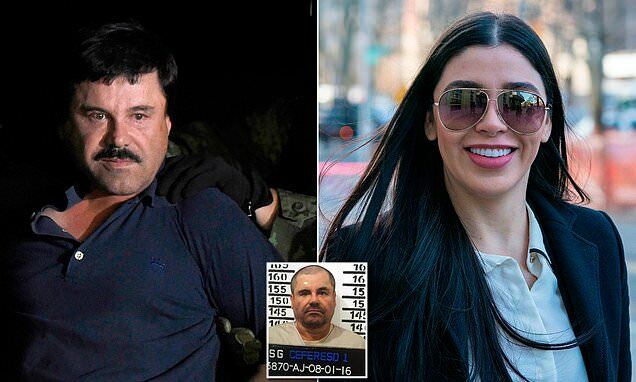 During Monday's testimony, the court heard how El Chapo was excited about the prospect of getting his life story on film, to evade the soldiers hunting him at a moment's notice and the court heard how he ordered the killing of an informant during witness testimony. The witness, Alex Cifuentes, was a member of a Colombian drug-trafficking clan when he was sent in 2007 to live with Guzman and his associates at one of the kingpin's hideaways in Mexico - complete with satellite TV and maid service - 'for business reasons,' he told jurors in federal court in Brooklyn. Business was as robust as Guzman's vanity: Cifuentes testified last week that his organization ended up making $40 million a month by supplying stockpiles of cocaine that the Sinaloa cartel smuggled into the United States. Lawyers for Guzman say Cifuentes is one of several cooperators who are framing their client in hopes of getting leniency in their own cases. Cifuentes described Monday how when his wife suggested that Guzman should make a movie about his life as a near-mythical outlaw on the run, 'He loved the idea.' There were two drafts of the story written but it never made it to production, he said.